Today I went shopping with one of my best friend’s Jenny (@Supernova5SOS on tumblr/twitter) and above is a generic photo of the local shopping centre we went to (please don’t stalk me). We had a genuinely lovely, very chilled day so in a very bloggy style, I’m going to tell you about it. Some people use blogs as a kind of diary right? It’s definitely something I want to try on days like this so I can remember how great it was. We’d agreed to get the 10 o’clock bus into the city and when I woke up at 9.57am, we then got the 11 o’clock bus into town and went straight for lunch because it was almost midday and neither of us had eaten breakfast. We went to Subway, had a lovely 6 inch chicken breast on italian bread with cheese and toasted, lettuce, cucumber and tomato (my perfected sub) with a chocolate chip cookie and a coca cola. I don’t know if you have any interest in my Subway order but I really enjoyed it, to be honest. We then went into a couple of clothes shops and a high street drug store, to WHSmith where we both bought a copy of ‘Rock Sound’ magazine and I bought some highlighters that were on offer before we went back inside the shopping centre to Primark. Primark is one of my favourite shops if I’m honest – most of my clothes come from there, they have some amazing logo t-shirts and all my hoodies and jumpers come from there really. I went yesterday with my sister and picked up a couple of bits but of course I found a few more things today. 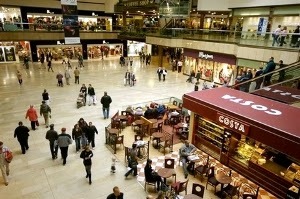 We ended up spending a lot longer in Primark than we anticipated and by the time we’d finished paying we were quite exhausted, walking out of the shop and straight into the Costas featured in the header picture for a drink and a sit down. We’re actually a pair of old ladies, not a 17 and 18 year old girls. 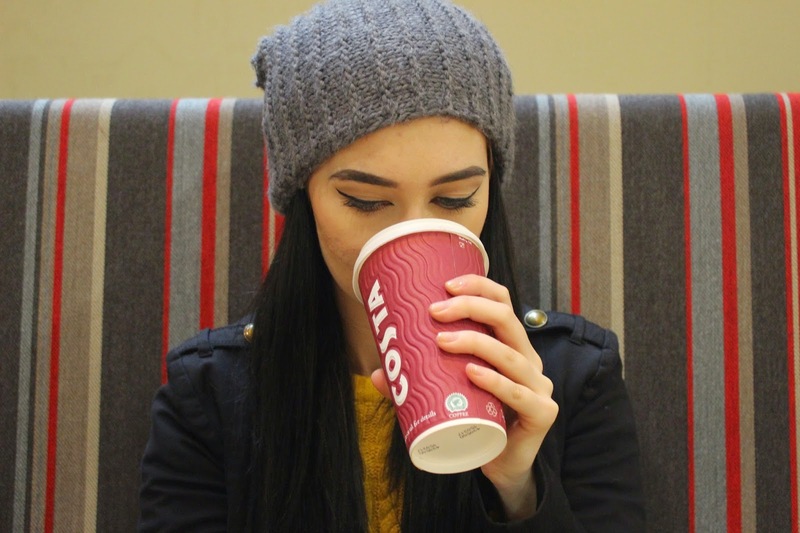 It was in Costa that we remembered that I’d brought my lovely Canon 100D camera with me and we could somehow make our own kind of Starbucks girls pictures. It started off well, with a beautiful photo of my adorable friend and her soy latte thing (I should probably know what it was) – looking very action-shot and blurry background. Very tumblr, I thought. 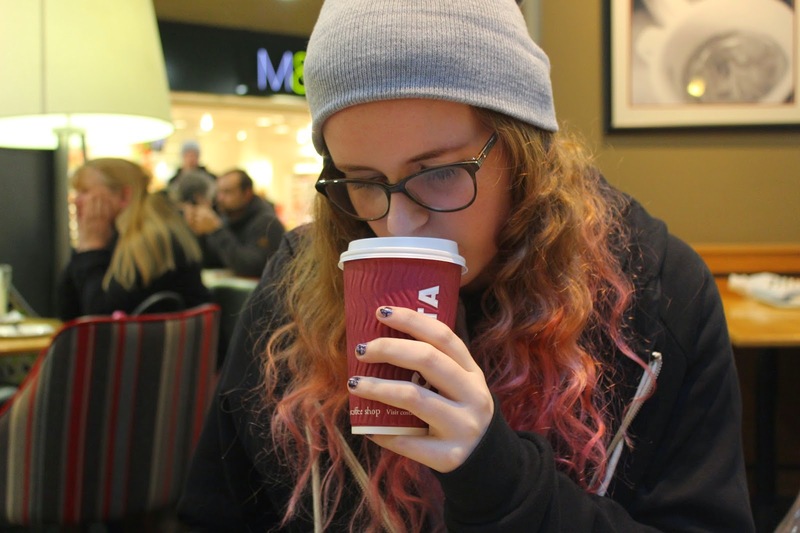 Jen took a photo of me but the lighting isn’t as good, my beanie isn’t as cute and I’ve just noticed how chubby my fingers look. 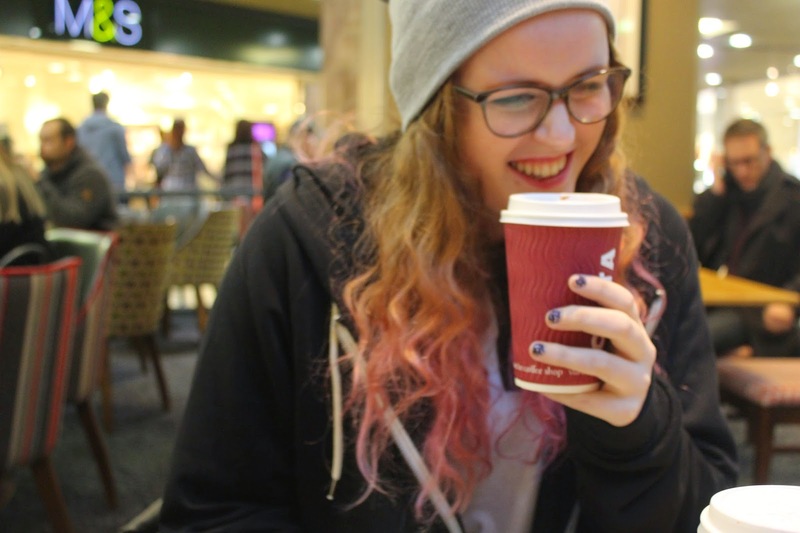 Though my hair looks quite nice if I do say so myself – still quite tumblr girl which is what we were aiming for. This is when it gets worse. Cute photo I guess – not quite in focus but laughing, action shot, still got the take-away Costa cup; still the vibe we were going for. But I don’t photograph very well. The camera always finds the wrong moment. 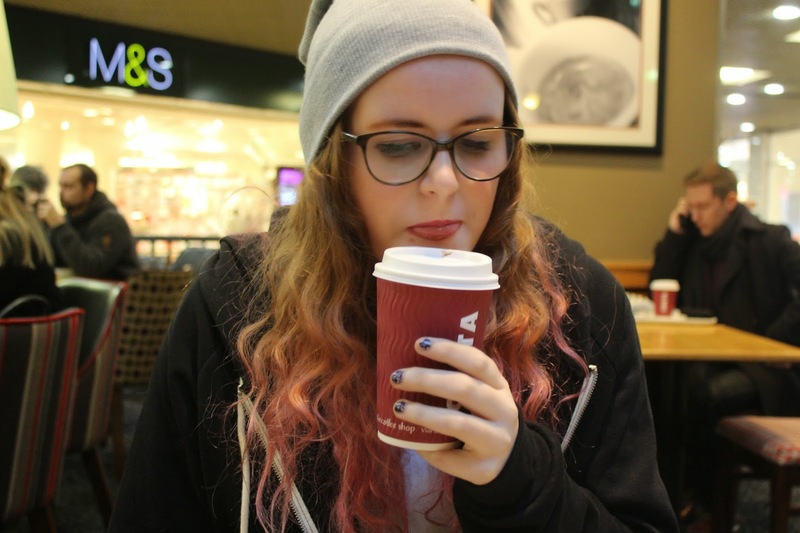 My tongue did not need to make an appearance but apparently that’s how I drink from a take away Costa hot chocolate. I still kind of like this photo though – it’s kind of endearing I guess. But that’s probably a very vain thing to say. 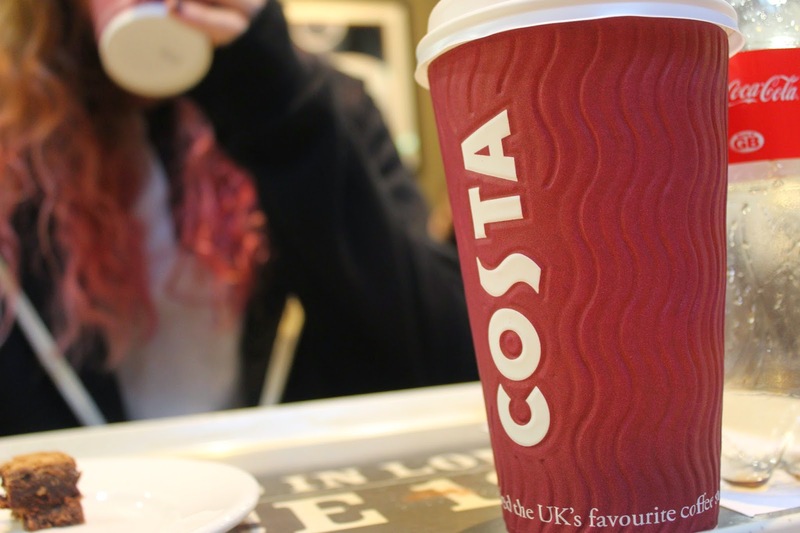 But obviously a nice picture of the ‘UK’s favourite coffee’ cup takes us right back to tumblr and out-of-focus background. How photographical. Photographical is not a word. After a lovely chit chat and a rest, we popped into Lush before catching our bus home. I bought the ‘Roots’ hair treatment and the ‘New’ shampoo bar (that’s what it’s called, it’s not the most recent) as recommended by Emma Blackery to help hair growth. I also bought the Lee Stafford hair mask for ‘hair that doesn’t grow past a certain length’ because my hair just does not grow. We then hopped on the bus and rushed around eating pizza in the car on the way to dance. It wasn’t a particularly extraordinary day but it was so lovely to be able to spend a bit of quality time with one of my favourite people with a bit of retail therapy on the side. Thanks for reading, if you like this style of blog do let me know and I might do it more often! Though most of my days revolve around school at the moment anyway.